PT Wijaya Karya Beton Tbk – WIKA Beton is a foremost precast concrete company in Indonesia and is a member of state-owned contruction giant, PT Wijaya Karya (Persero) Tbk (WIKA Group). At present, WIKA Group is the majority shareholder at PT Wijaya Karya Beton Tbk, with 60% of ownership. Other 40% remaining shares was owned by the general public. 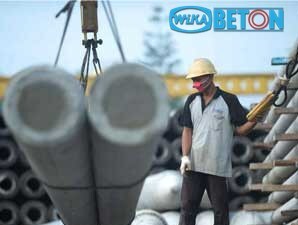 WIKA Beton has been operating in Indonesia since 1977 and initially started as a division of WIKA Group. Since 1997 WIKA Beton has officially operated as a separate business entity from PT Wijaya Karya (Persero) Tbk. Later in 2014, WIKA Beton went public and its shares listed on the Stock Exchange (IDX) under ticker code WTON. Headquartered in Bekasi West Java, WIKA Beton now has 8 concrete plants, 6 sales area offices and 2 sales representative offices spread across Indonesia. in term of financial position, PT Wijaya Karya Beton Tbk succeeded in posting excellent financial performance in 2014. WIKA Beton recorded a growth of 23.96% in total operating revenue amounted to Rp3,277.19 billion as compared with Rp2,643.72 billion in 2013. Total net profit went up by 33.66% from Rp 241.20 billion in 2013 to Rp322.40 billion in 2014, according to WIKA Beton Annual Report 2014 as cited by JobsCDC.com. Fluent in English both oral and written and have a minimum TOEFL score of 500 from trusted institution. Single/not married and willing not to get married during the first period of work.